(Updated 8:43 p.m. EDT) -- Tropical Storm Isaac has so far affected two cruise ships in the Caribbean, as it barrels toward the islands with hurricane-force winds. In order to avoid the storm, which reached hurricane status momentarily on Monday, Carnival Vista is operating a reversed itinerary; the ship departed from Miami on September 8 and is expected to return to Miami on September 16, as scheduled. Princess Cruises also has adjusted Caribbean Princess' itinerary, replacing a handful of calls along the storm's path. The ship, which is on a 10-night cruise that departed from Fort Lauderdale on September 8, will stop in San Juan, Amber Cove, Grand Turk and Nassau in lieu of St. Kitts, St. Lucia, Antigua and St. Maarten. 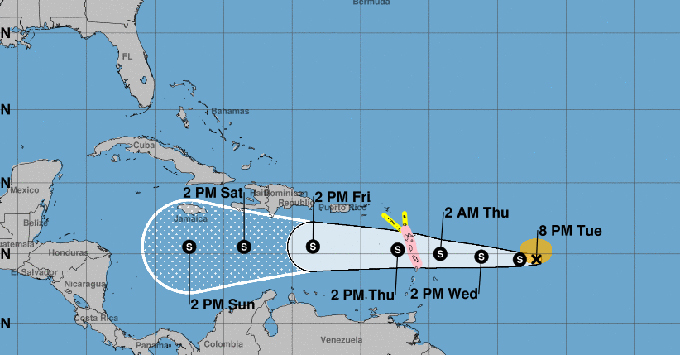 Tropical Storm Isaac has maximum sustained wind speeds of 70 miles per hour and is expected to be near hurricane strength when it moves through the central Lesser Antilles, according to the National Hurricane Center, on Wednesday. Some weakening is forecast for Friday and Saturday. A hurricane watch has been issued for the islands of Guadeloupe, Martinique and Dominica, while a tropical storm watch is in effect for Antigua, Montserrat and St. Kitts and Nevis. Hurricane Florence is also in the Atlantic, currently on course for the East Coast, and causing cruise deviations on Bermuda itineraries. Tropical Storm Olivia also has affected Hawaii cruises in the Pacific. Cruise Critic will continue to update this story as more information becomes available.